How exactly do you spin from silk cocoons? Is it kind of like spinning from the fold? Any answers would be muchly appreciated. 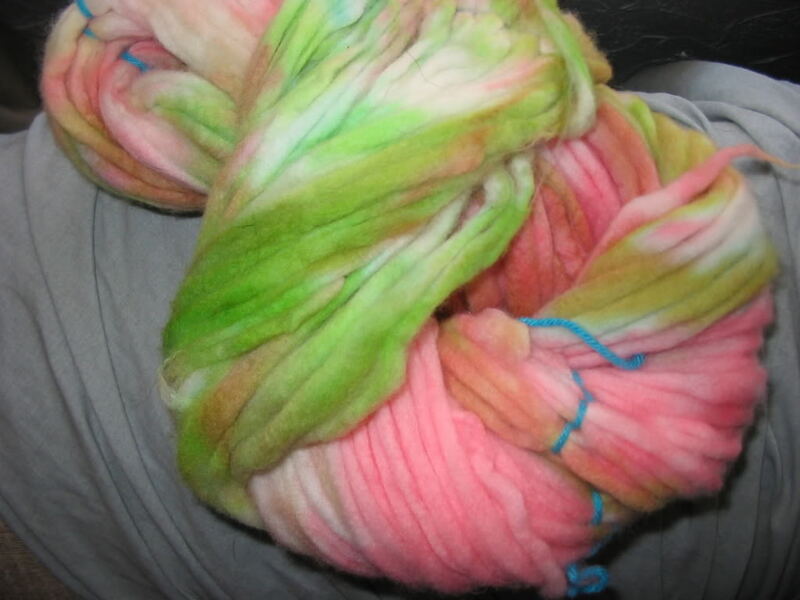 So I bought some snow white meraino so I could try dyeing with kool aid on a larger scale. 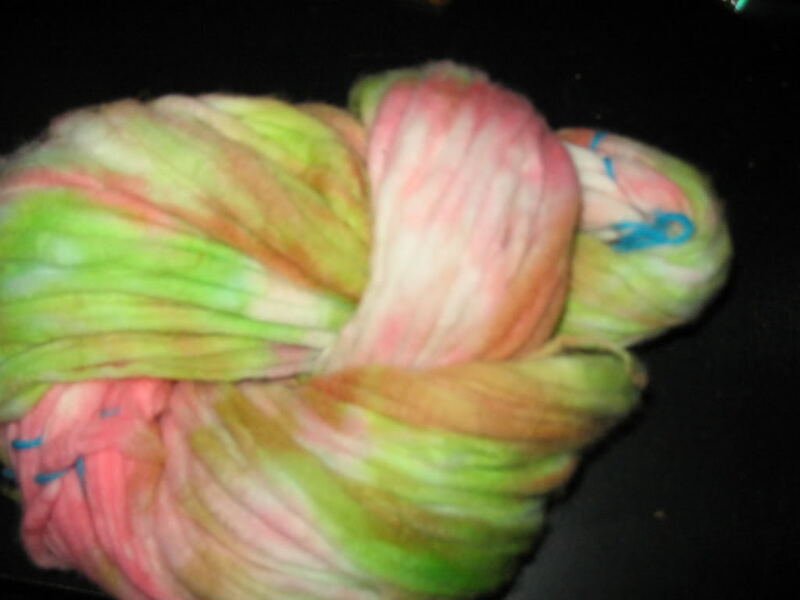 I have only done small dyeing projects. I call it Strawberry Fields Forever. I can't wait to see how it spins up! I tried dyeing with kool aid and it turned out fantastic. Although I thought I was using blue as the package was blue, but turns out it was fruit punch. Guess I should read the lable next time. 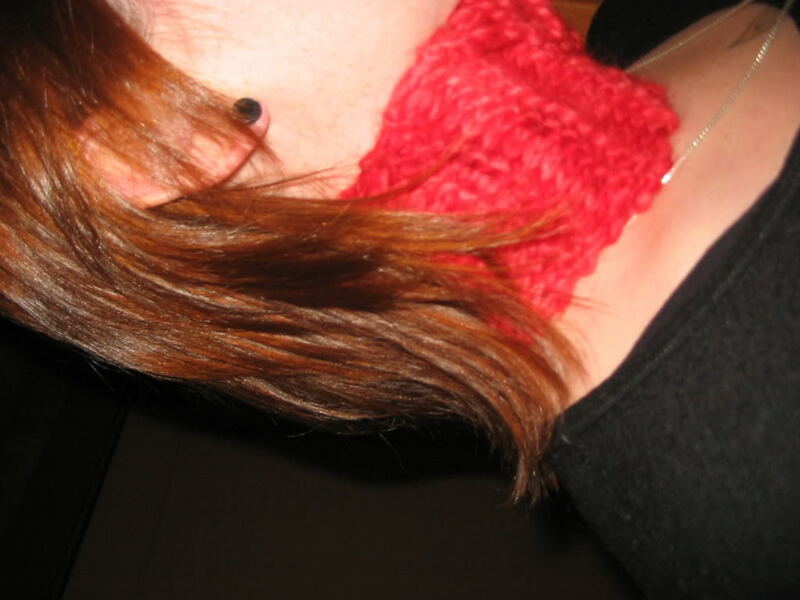 I made a scarflet out of the yarn. 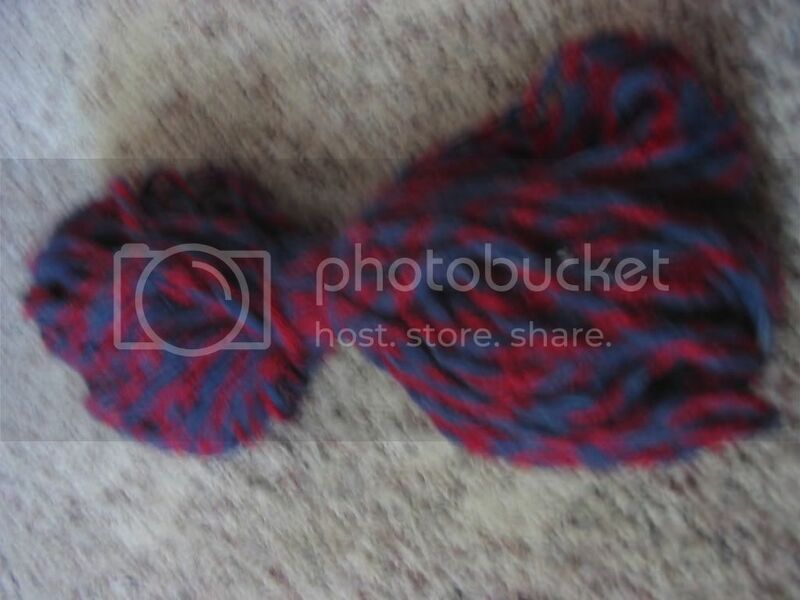 I found the yarn at the thrift shop. So I just have a quick question for all you smart, smart people out there. When I am plying singles together and am finished, do I need to set the twist again? 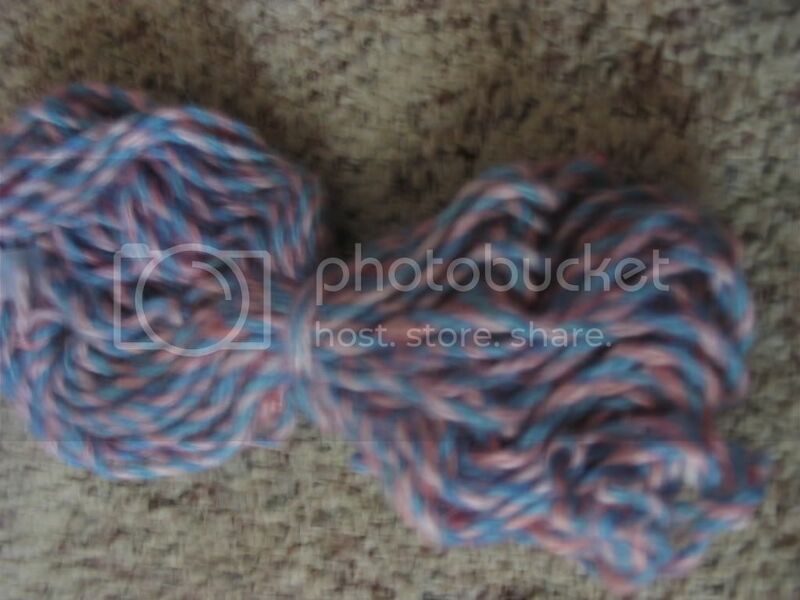 I always set the twist when I am done spinning the singles, but am finding that my plyed yarn twists up on itself. My singles usually do that before I set the twist, but not after. Am I crazy? 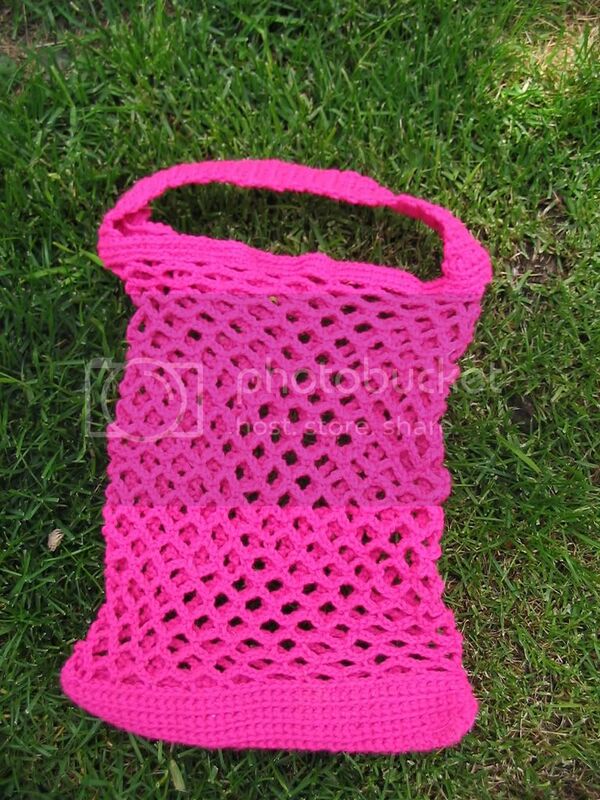 Also what is blocking yarn? I've been reading the tour de fleece thread and have seen people using the term. I'm completely in the dark on that one. 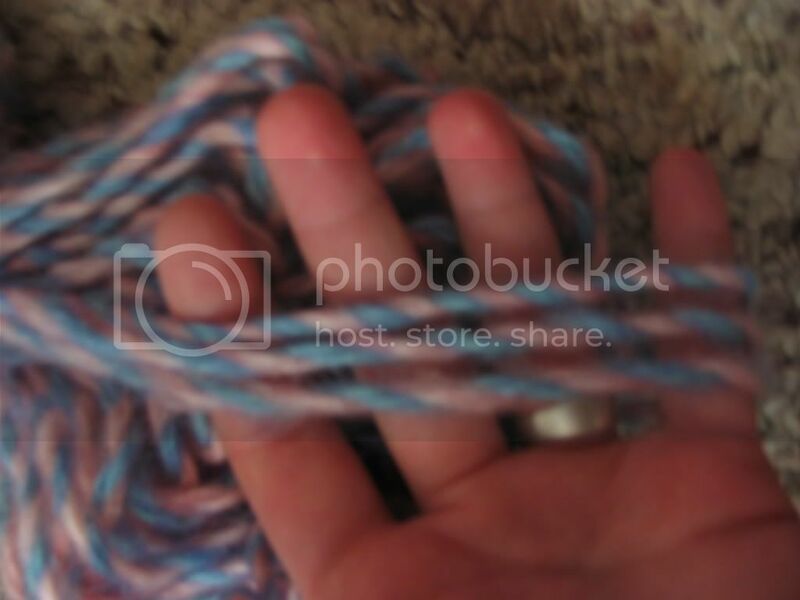 So I've been plying abunch of my yarns together to try to make more room in my stash for more. I call this one pink ice. 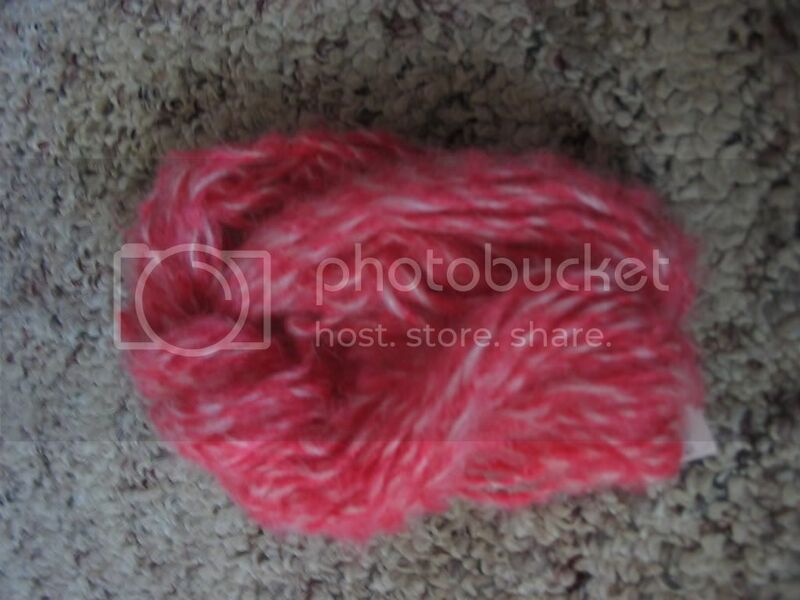 It's a baby pink mohair plied with a darker pink thrift store find. I call this one hey boy hey girl. It's think and gorgous. 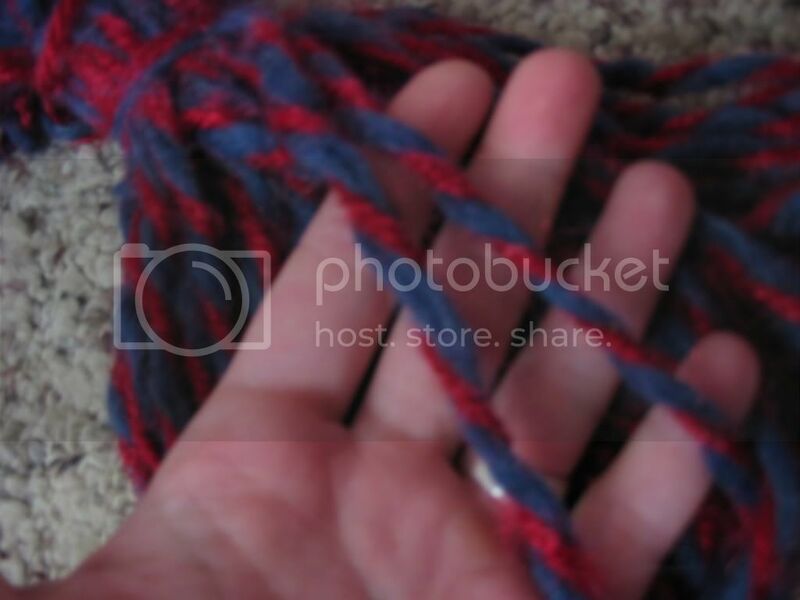 The dark blue is quite fuzzy and the red has a really nice sparkle/shine to it. And this last one I call cotton candy. Both colours have subtle tones in them so they almost look like watercolours. I'm so pleased with how everything turned out! Hooray! 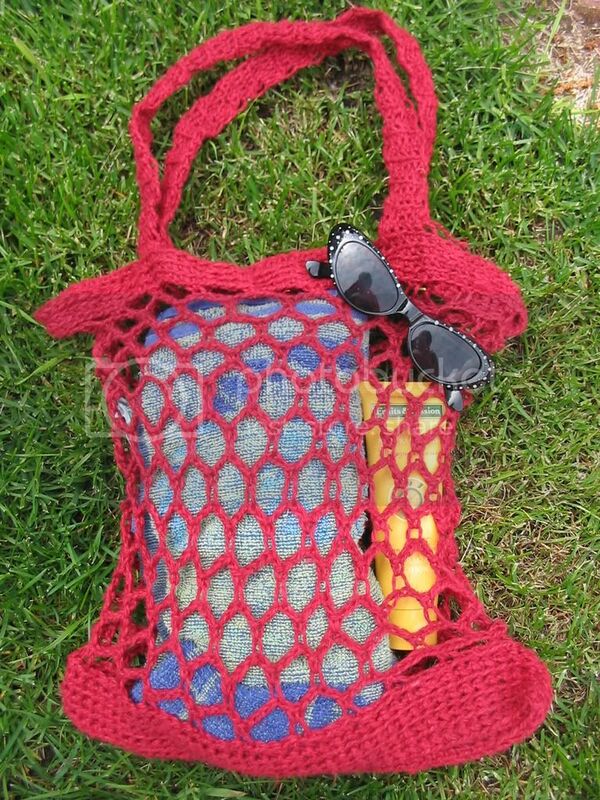 i think these mesh bags are the greatest.. They work well for grocs; you can fit a ton in them. 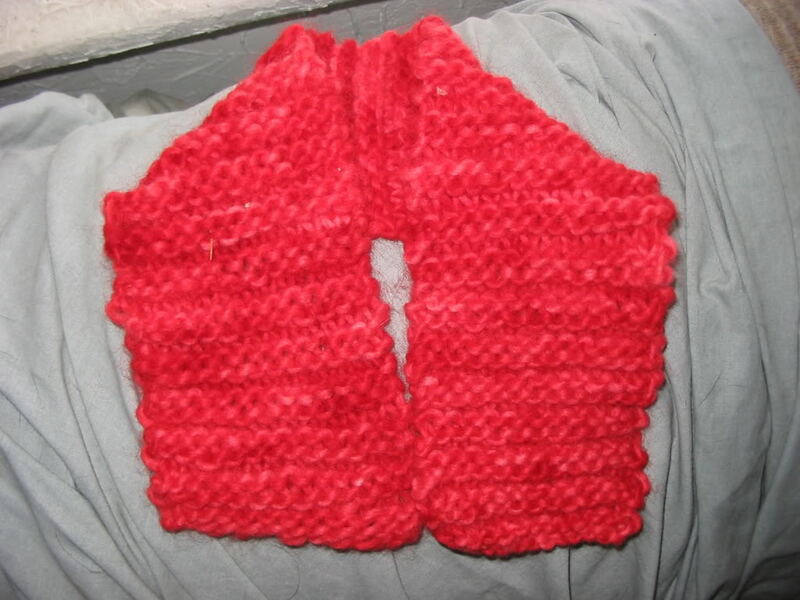 The pink one is made of acrilic yarn and the red one is made of a hemp wool 50-50 blend. 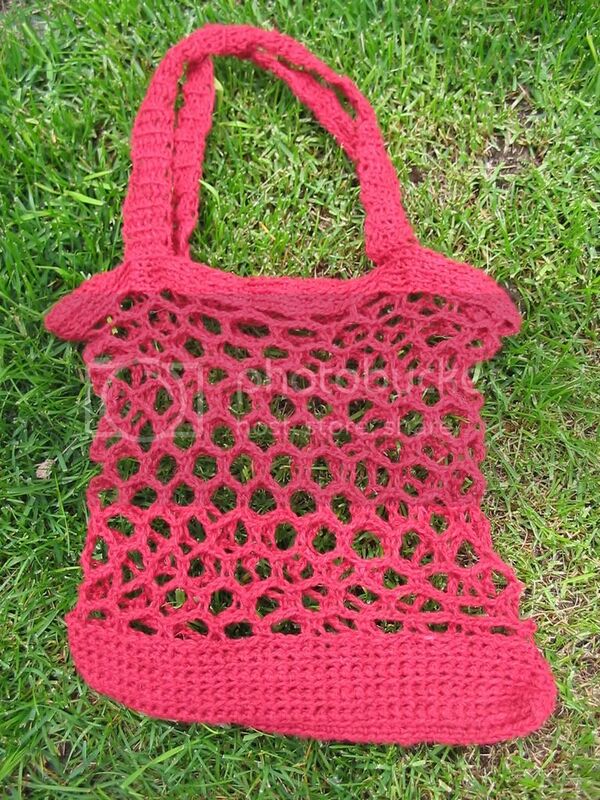 I have been very busy with lots of crafts lately. 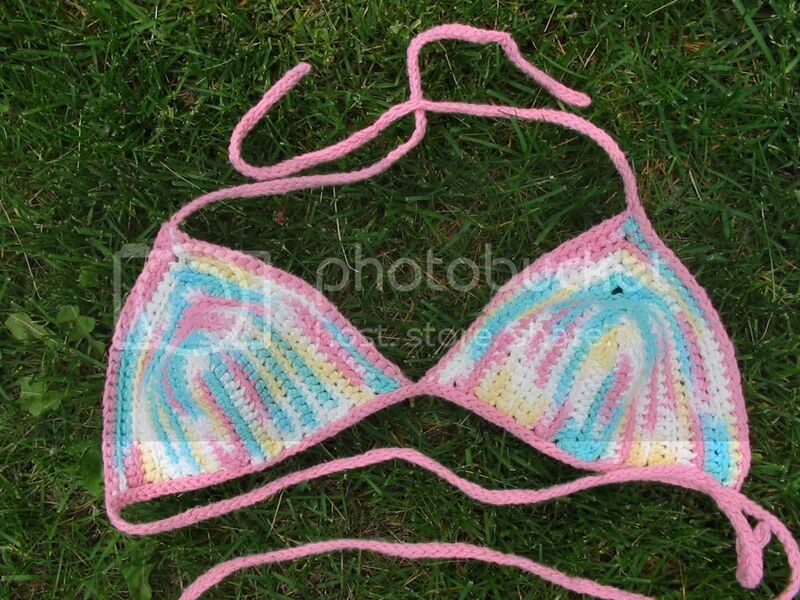 I've made what feels like a million bikinis . Check out the photos. I could possibly put a tute on here if there are requests. Happy crafting! So I am all about wrap skirts these days. They're great. 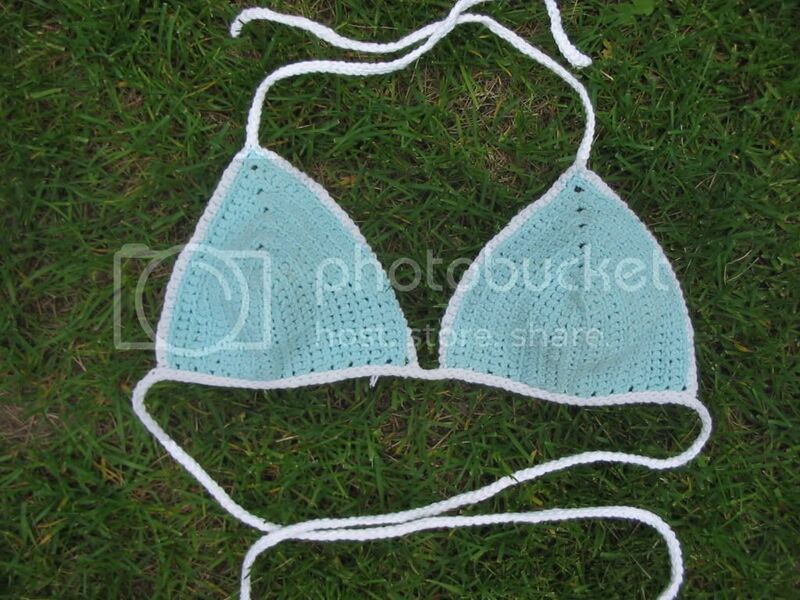 One size fits all and they are so easy to make. For this skirt, I basically just wrapped some material around my waist and added a purple zipper where the two peices met. I embroidered some headphones on the left hip and my initial on the left knee. Check it out!